But that not’s too say over the colder months here, it does tend to get a little neglected. This week I have started to wash all my cushion covers, I have been very naughty and have left them out in the rain, so they are a bit grubby. The cover for the scatter cushions have come up a treat, the lounge upholstery I am not so sure. But we will see. I am really into the desert gardens of Palm Springs. 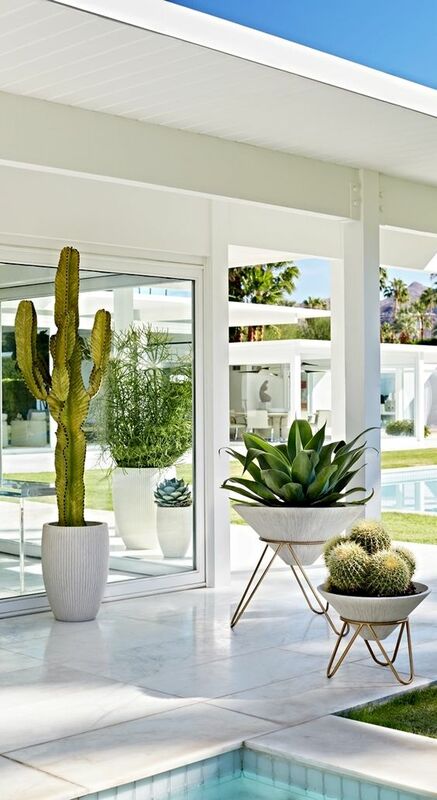 Although we are not desert dwellers (Sydney is semi- tropical) and nor do we have a amazing pool, I still want it to feel like a small private resort with a little glam, so I am still gonna use some of the elements from these gardens on my outdoor area, like the bright colours and of course the succulents. Succulents, I love them. I love the shapes, the textures and the fairly low maintenance, I love having plants and greenery but I’ll be honest, I am not always the most green fingered person. Not for the want of trying. 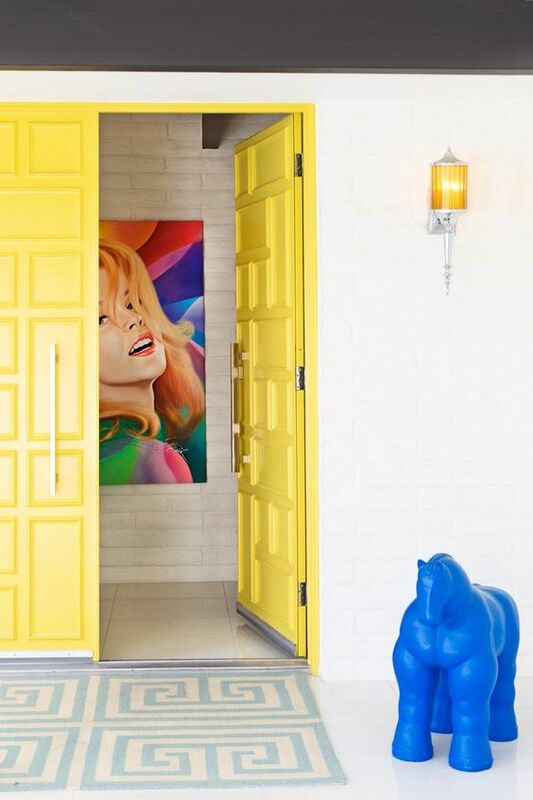 So I have been scanning Pinterest for ideas and inspiration to create my own little piece of Palm Springs. Love it or loathe it. 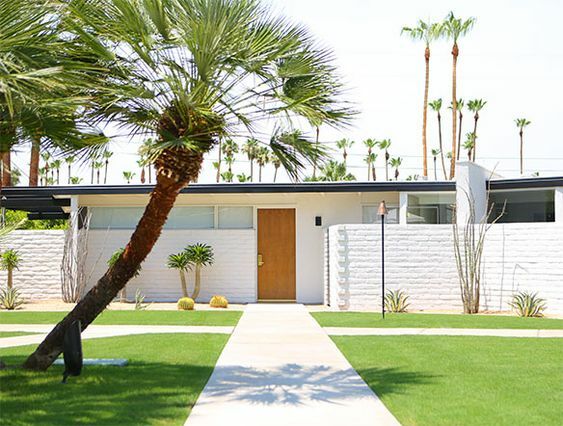 For me you cannot think of Palm Springs and not immediately think Mid century. These breeze blocks are Palm Springs. When people see this in front of a house and they are grimy, covered with water marks, the first thing people think is “they have got to go!”. For me when painted a crisp clean white, they are amazing. Although I am not going to start building breeze block walls on the terrace, there is an alternative, which are laser cut metal screens. 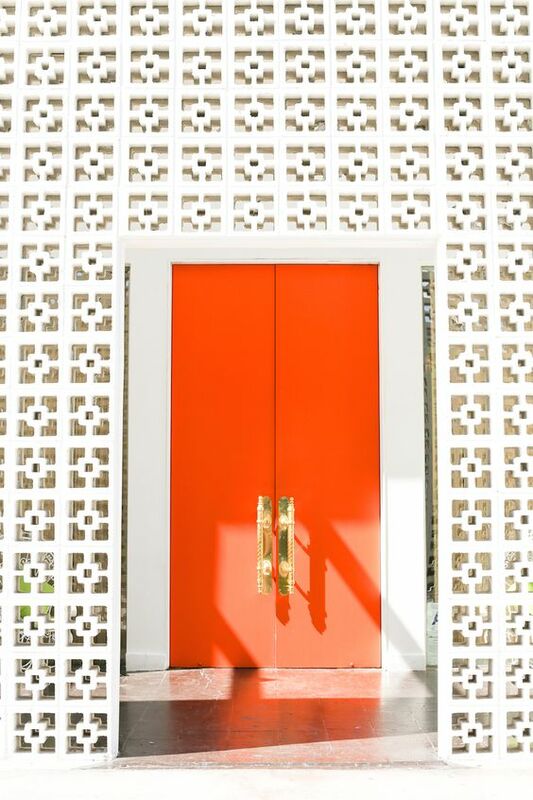 These can be cut in to any design, including a mid century breeze block style. Powder-coated in crisp white paint, I think could be a winner. And the all important succulents in streamlined crips white pots. I have gone for simple white concrete planters that have a speck of light grey much the same shapes as the picture above. They are a really strong contrast to the greenness and sculpture of the plants. Ok Palm Springs is in the desert, yet has some of the most crazily green lush lawns ever!!. How?? Fake, maybe?? Who knows. I have been considering some fake grass for our outdoor space for a while now. We found a supplier that has some really realistic fakery going on that will stand up to the harsh Australian sun. It’s also soft under foot. And finally what’s Palm Spring without the colour. Ok so I might not go this crazy but you get the drift. My colours will come from the textiles of my cushions. They are a Sunbrella fabric in ‘Aruba’ and the ‘Peacock’ design in ‘Pool’ by the amazing Trina Turk. Both fabrics, pick up the colours I associate with Palm Springs, blues of swimming pools, green of the lawns and succulents and the bright white of the architecture. So what do you think?? Hitting the mark? Now all that’s needed is to pull it all together and we will be sitting outside enjoying the sun faster then you can say Dirty Martini!! Next ›Pep Talk – Come On We’ve Got This! !